What Kind of Additional Security Barriers Could You Benefit From? Does your facility need additional security barriers? Take a look at some of these options. When trying to secure your commercial property, it’s important to make sure you’re covering all the bases. Between protecting employees, clients, and visitors, it’s often important to consider all of the options out there. There are, thankfully, many kinds of security barriers out there that can make a huge difference. Let’s take a look at three security barriers that your property may benefit from. Louvers are similar to fences but they are slatted, allowing for airflow while offering much less visibility than your typical fence. This is an ideal solution if you’re concerned about privacy in addition to security, as it can keep peering eyes away from your property. Most louvers are made of aluminum, which is a fantastic material that doesn’t require much maintenance at all. Louvers are a great option if you need to promote airflow too, which may be the case if you’re fencing in a generator or air conditioning unit. 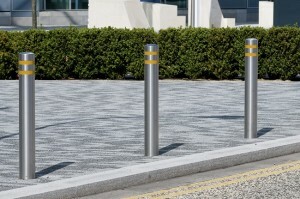 Bollards are those big round posts that are often around commercial buildings. You may not realize what they’re for, but their purpose is to protect against accidental or intentional vehicle crashes. They can also assist in defining the barrier between walking areas and road areas. This is a great option if you’re in an area with high foot traffic as well as vehicle traffic, as it can keep the two separated and prevent dangerous crashes. Palisade fences are effective security fences that make it difficult for intruders to gain access to your facility. Palisade fences are built out of galvanized steel with rods spaced out, which makes for a pretty effective security barrier. Not only is steel a tough material that will live up to your expectations, but it also makes it impossible for anyone to climb, and the spaces between the rods make it impossible for anyone to squeeze through them. If someone were to try to climb over, most palisade fences have spikes on the top to prevent anyone from getting over. This entry was posted on Friday, August 10th, 2018	at 11:30 am	. You can follow any responses to this entry through the RSS 2.0 feed. Both comments and pings are currently closed.